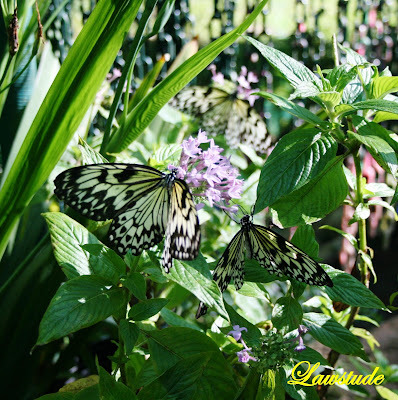 The Butterfly Sanctuary is a small garden full of well, butterflies. It is located inside Camp John Hay and entrance fee is only Php 40 per person. On the time I was there, there are only few butterflies around and I have seen only a couple of varieties. The place also features lots of flowers and a small pond with a little mermaid fountain. The place is perfect for kids because these butterflies can be placed on your shirt, on your hand, and even on your nose. I even had a shot taken with butterfly on my lips. Such sweet creatures. 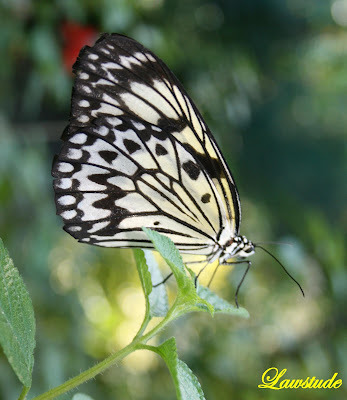 The Butterfly Garden in Subic is located just in from of the Zoobic Safari in Subic Bay. For an entrance fee of Php 50, one can play with more than a dozen variety of day-time butterflies. These butterflies seem to be well acquainted with visitors because as soon as you enter the garden, these butterflies fly everywhere and eventually rest on your head, shoulders and shirts. And if you wear perfume, there is a strong possibility that they will swarm you. funny that what they term as butterfly sanctuary is actually an oversized cage with plants. wild ones are better. great cool shots! hope you'll visit my corner too. Ang ganda ng mga butterflies. Kakainggit naman. never been to a butterfly sanctuary yet. i've been to camp john hay but didn't know there was a sanctuary there. thanks for the preview. As you say, butterflies are beautiful little creatures! And your photos are the proof of it. nice nice! hope i can visit the World of Butterflies in marikina soon. bakit di kita yung face mo?! 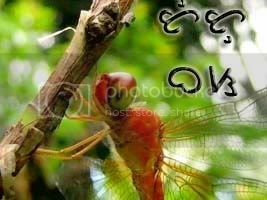 daya..
@ estan - have u seen mariposa. i remember seeing then in their natural habitat in laguna. mas maganda talaga pag free and wild. @ kurisujae - summer na naman eh, time na naman maglibot. 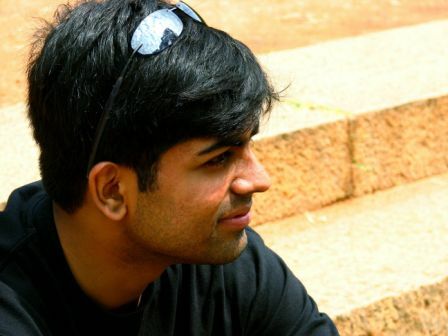 @ snap catch - welcome to my blog, syempre ill check your corner too. may message na nga ako dun eh. have a nice day. @ vanessa - colorful creatures. di pala totoo na nakakabulag sila. @ mink - thanks for appreciating. and welcome to my blog. @ the dong - na miss nga namin yung place kasi yung merker/sign nya eh opposit ng road, so sa pagbalik mo makikita yung sign. @ cedeux - doc maglibot tayo minsan. halos kabisado ko na baguio. @ quintarantino - the subjects are beatiful so the photos came out nice. (except shots of me lols). @ vangelis - thanks, i had a great time catching these little critters. @ aajao - baka kasi ma upstage ko yung paru-paru eh. hehehe. @ random rambling - marikina? hmm. saan doon? puntahan ko nga. na-inspire ako kay coldman eh, tinago nya face nya kaya ginaya ko din lols. Hello. I have been there last year and was dissapointed because there are only few butterflies. Good thing it is in Camp John Hay because we had a chance to visit the entire place. @ razi - thats great. have you tried chocolate de baterol? its yummy and perfect for the cool place. @ anoop - you have to be really patient. but with lots of people around trying to play with butterflies, it really is quite difficult to shoot. @ dean - make it a submarine lols. @ ferbert - ayos di po ba? pero halos magkakamukha naman butterflies eh. @ kegler - lols carlo, you don't go to a particular place just for butterflies, its just an added bonus kasi maganda naman yung mga lugar. Hello Lawstude. Do you do Meme? I just tagged you hope you answer it. lawstude salamat. babalikan ko talaga yan kasi hindi ako nakapag slide for life nung una kong pagpunta. 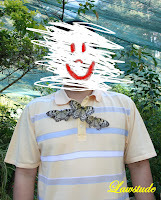 I'd been into this butterfly sanctuary in Camp John Hay in 2004. Never been into that place again since then. I like butterflies especially if they are not held captive. The butterflies are beautiful. I am sure it is an interesting place to visit. It is funny how you colored over the faces. @ random ramblings - tnx again. btw, something wrong with ur blog, ur profile cant be found. @ vanessa - tnx. ill get back to u on this one. @ the dong - slide for life? mukhang ok yun ah, sa john hay ba yun? @ dodong flores - never been to lamesa park yet. great captures you had. idol. i learn a lot through you photos. @ andrea - lols, i hid my face so as not to distract you all. its a butterfly show anyways. lawstude, may slide for life sa La Mesa Ecopark. astig yun. Wow, I love your butterflies too! It's hard to shoot hem. Mine was probably a bit confused, cause I rescued him out of a barn, so he sat stil on my arm for a while. @ bw - macro lens are on my wish list together with an ultra-wide lens. For now, I just have to content myself with the macro feature of my cam. The butterflies messed me up real bad lol. But the smile is still there. @ the dong - never been there dong, but if u recommend it i can try it. thanx again. @ alicesg - pretty little creatures indeed. lols thnx. @ ferdz - at ang likot nila kaya nakakatuwa pag nakunan ng nakadapo. medyo nasasanay na rin ng konti. wala time for formal lessons pero i learn thru your blog and other blogs too. @ astrid witte - too bad they only have about two weeks to live, but i guess the circle of life will always continue for them. Butterflies are beautiful! Pero they also remind me that our lives are short and that we ought to live to best we can b/c of their short life span. Pero cute pa rin ng smile! Hahaha! 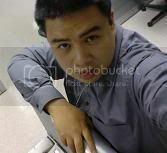 ni-link kita sa blog ko ha...thanks! takot ako sa butterflies. sa ipis o kahit anong nakakadiring insekto hindi ako takot, sa butterflies lang talaga. @ kyels - i couldn't agree more kyels. life is really short so it is best to do what we really want in this lifetime. @ luke - thanks for the visit sir. @ coldman - di naman. gaya gaya nga ako eh pero di ko papalitan hehehe. @ shades - the subject is just really wonderful shades. @ prinsesa - baka hindi picture worthy mukha namin hehehe. Pero if you check some of my earlier posts nagpakita na ko ng mukha. si coldman di pa hehehe. @ abad - talaga??? ako takot sa gagamba lalo na yung malalaki, pag nakakita ko ng gagamba kailangan mapatay ko agad kung hindi di na ko mapapakali baka balikan nila ko. weird no? like eastan, i now prefer butterflies in the wild. so much more beautiful than those in cages...thanks for the info on the gardens though. was looking for confirmation on the subic one. 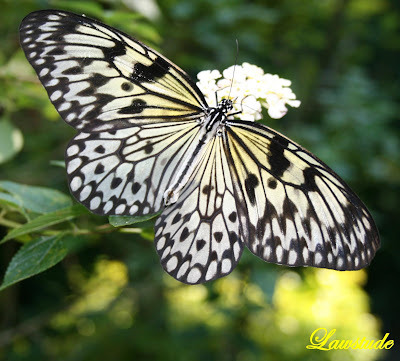 lawstude, i am very much familiar with butterflies since I used to collect them in the forests of Quezon, Tawitawi, Bohol, Cebu, and many other islands. 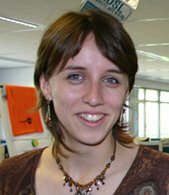 However, I switched to beetles since these are still much understudied (check my http://salagubang.net site). These creatures are better in the wild.